I made spaghetti the other night. In my family, there is a pasta deficiency, in that there is always way too much or way too little pasta in any given meal. In this particular spaghetti meal, I kind of overshot the pasta by about 3-4 servings, so I had a whole bunch of pasta in the fridge. Now, what to do with leftover pasta? My first thought was an Asian salad, but Shaun likes spicy and the kids hate peanut butter, so that was out. I finally opted to use lots of garlic, butter, parmesan and the last little bit of pesto for a yummy fried noodle. 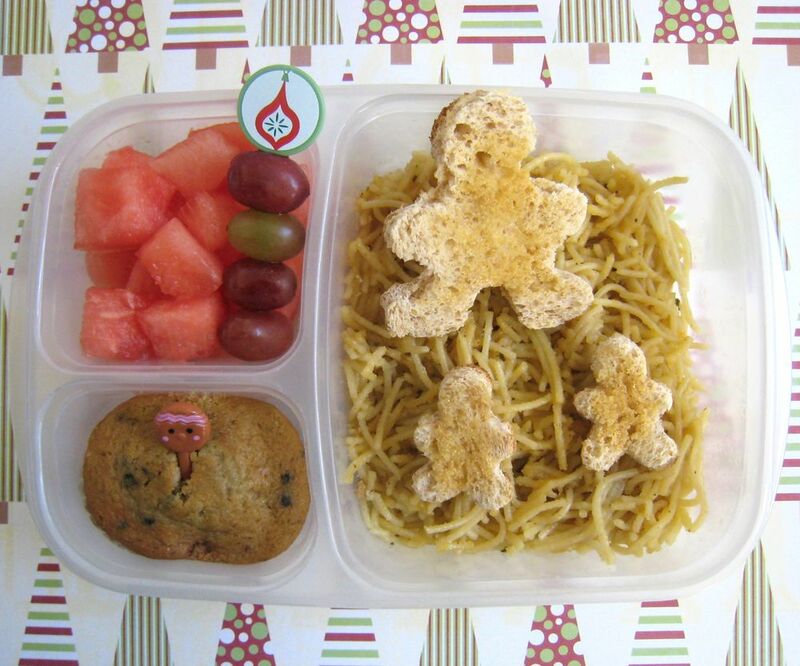 Faith has the aforementioned pasta, along with some gingerbread man shaped garlic breads (toaster oven, cookie cutter, bit of butter & garlic, and you've got really quick garlic toasts). Along with that, she has watermelon and grapes, along with a mixed berry muffin from my freezer stash. I love my freezer stash. I'm out of freshly baked sweets, but was able to defrost two muffins in a minute, and we've got lunch! 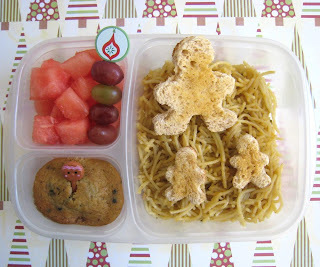 It's packed in an EasyLunchbox today, the layout worked perfectly to keep the garlic-y pasta and bread separate from the fruit & muffin. For Mrs. Q's Fed Up With Lunch Challenge, total cost, around $1ish, pasta was leftover from a big bag (that was $1 total), bit of butter, bit of cheese, lots of garlic, the leftover pesto I made (basil free from a friend's garden); one slice of bread into toasts, watermelon free from my garden, grapes (free, leftover from the ILs), muffin from my freezer stash, I think I'm around 20cents a muffin. I agree, freezer stashes are priceless, in the way of both time and saving money by cooking/baking in larger batches :-) Of course, then I tend to get to the point when its a few weeks of eating straight from the freezer stash to clear it out and make room for new stuff when I forget to actually *check* the freezer before making new items! Thanks for hosting the What's for lunch Wednesdays!